This week’s word a week challenge – ornate – presents an opportunity to show off a bit of Wisconsin, my home state. That bit will be a few of the photos I have taken of the Wisconsin Capitol. Located in Madison, Wisconsin, the Wisconsin Capitol is a spectacular building and if you are ever traveling through the area it is worth visiting. It is very large. The U.S. Capitol is just three feet higher and if measured by volume the dome of the Wisconsin Capitol is the largest in the U.S. and one of the largest in the world. It is the largest granite dome in the world. The Capitol features numerous significant pieces of artwork that are either part of the building or are on display inside or just outside of the building. One of the major pieces of art is a mural by Edwin Howland-Blashfield. 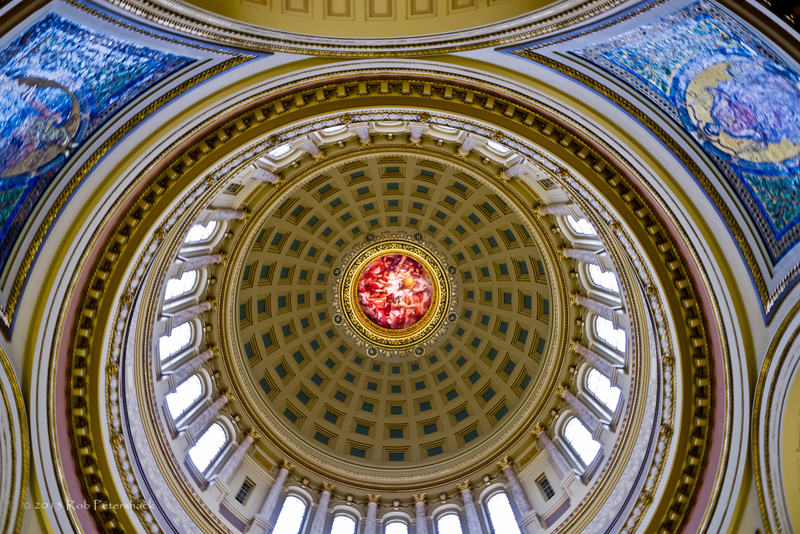 The mural, “Resources of Wisconsin,” is 34 feet in diameter and is 200 feet above the Capitol’s ground floor The first photo below is a view of the interior of the ornate interior of dome. Of course the problem with photographing structures, particularly the interior of the structure of things such as domes is that the camera flattens the 3D object into two dimensions so you may not get a great feeling of what the dome is like. I tried some experiments to see if I could get a photo that would provide an alternative view of the dome and came up with the second view of the dome that you see below. 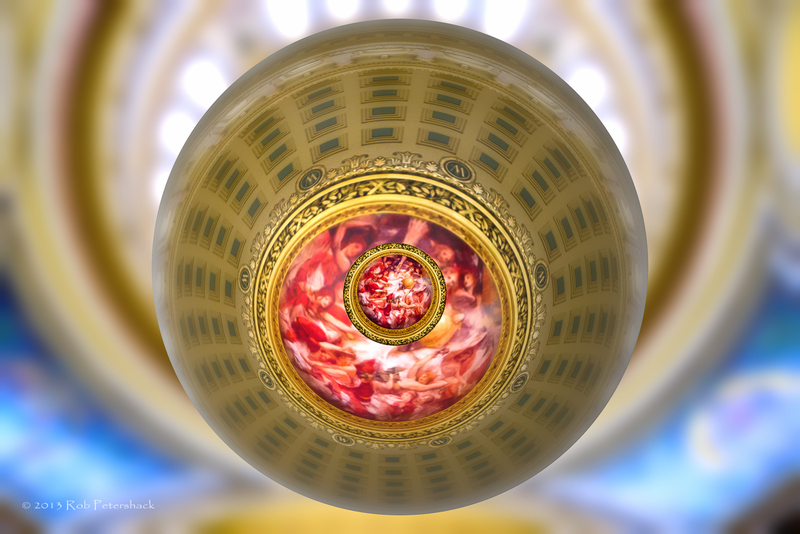 It is a rather whimsical depiction of the dome in which the elaborate Blashfield mural is duplicated within itself and then the upper part of the dome is digitally inverted to point down. This is intended to give the viewer of the second photo a reference point to use to get a better idea of the actual steepness of the dome in the first photo. I hope it accomplishes its purpose in an entertaining way. But enough of my experimentation, if you want ornate the Wisconsin Capitol will give it to you in spades. The next photo contains most of one of four mosaics created by Kenyon Cox for the Capitol Rotunda. (The mosaics are “Legislation,” “Government,” Justice,” and “Liberty.”) Each mosaic is 12 feet high and 24 feet wide and contains approximately 100,000 pieces of glass tile. Also note the ornate plaster work framing the mosaic. Please excuse the awkwardness of the image. 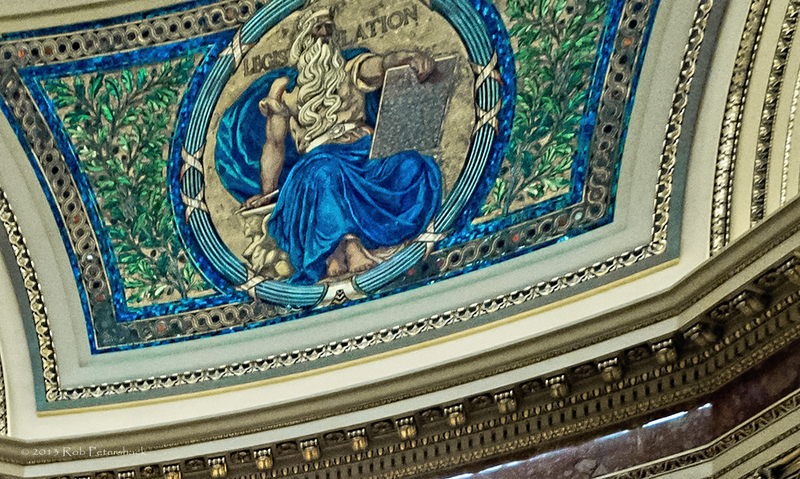 It is a detail taken from a much larger photo of the Capitol Rotunda. 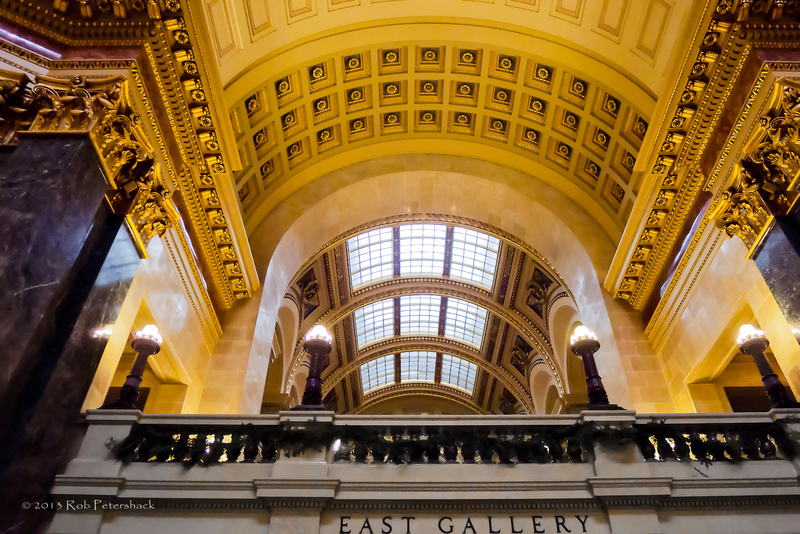 Here is a view of the East Gallery, which houses the Wisconsin Supreme Court and part of the Governor’s offices. (Incidentally, the Wisconsin Capitol was the subject of a major renovation project between 1988 – 2002. Also, contrary to some stories, the building was not materially harmed by the huge demonstrations that occurred in 2011 and free tours of the Capitol regularly operate.